At some of my favorite Mediterranean restaurants, I often order kofta kabobs which is generally seasoned ground meat (usually lamb or beef) formed into meatballs. They can be prepared in various ways such as fried, steamed, poached, baked or marinated, but my preference is grilled. For our party, I prepared the following recipe where I increased the measurements of spices and seasonings used for more flavor. The seasoning is key because it's a delicious blend of coriander, cumin, cinnamon, allspice, cayenne, ground ginger and ground pepper. Also included is grated onion, niced garlic and finely minced fresh parsley. I found this is best when prepared a day ahead and formed on the skewers and then grilled the next day. My husband was in charge of grilling these kabobs and he suggested grilling these first on a piece of foil on the grill. Once the kofta have firmed up a bit from cooking, you can transfer them to the actual grill grate off the foil to get the charred, smoky flavor. Grilling this way prevents the meatballs from fallling through the grill grates and will help keep its shape as it cooks. Mash the garlic into a paste with the salt using a mortar and pestle or the flat side of a chef's knife on your cutting board. Mix the garlic into the beef along with the onion, parsley, coriander, cumin, cinnamon, allspice, cayenne pepper, ginger, and pepper in a mixing bowl until well blended. Form the mixture into 28 balls. 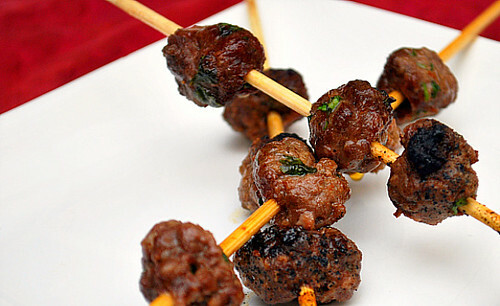 Form each ball around the tip of a skewer, flattening into a 2 inch oval; repeat with the remaining skewers. Place the kebabs onto a baking sheet, cover, and refrigerate at least 30 minutes, or overnight. Preheat an outdoor grill for medium heat, and lightly oil grate.Place a piece of foil over the grate and place the skewers onto the foil. Cook the skewers on the preheated grill on the foil turning occasionally, until the beef has firmed up. Once firm enough to hold it's shape on the skewer, continue cooking the skewers off the foil and on the grate to get a slight char and cooked to your desired degree of doneness. Mm, what a gorgeous color they have! They look yummy! Those look delicious! Thanks for the recipe. I have a question about your photo. I see your skewers look perfect with no charring. Did you grill the kabobs first and then use clean skewers for the picture? @Greg - The 'clean' skewers are probably due to my husband's grilling technique of grilling the kabobs on foil first and then once they were cooked to a nice firmness, transferred onto the grill grate for some char. The tips of the skewers were definitely charred moreso than the middles, which you see in the picture. That looks great. I love kabobs. Hot damn! I love the look of these and will put them on my dinner menu pronto! I love kabobs! Thanks for the great grilling tip. I wish I'd thought of that!